I'm Kenth, 32 years from Finland. After buying (collecting) some pc and a lot of console games for most of my life I've now been more and more into arcade games lately. I have two arcade machines, about 10 boards and maybe 12 MVS carts. I'd like to get more dedicated cabs this year and was planning a summer trip around it. I don't have much space and I'm not filthy rich, so I'll have to be a bit picky on what I get. Was thinking a road trip to europe (Belgium or Netherlands) would be fun if I'd find a cab to bring home. Looking into this made me find this fine site. Hopefully I'll be able to buy a game or two off some of you in the future. You're not "filthy rich" but you own at least a Cave PCB which is rather expensive. By the way, what game is it? Amazing game though. My favourite at the moment I think. Progear graphics are amazing! The atmosphere is great too. Personally I rather like vertical shooters than horizontal ones. I mean; they look easier to me. I don't really mind it being horizontal, but I've been hoping to get a cab with a vertical screen sometime soon. Preferably a Sega candy. But a dedicated vertical 15k jamma cab would be nice too. I'd just swap in any vertical shooters I'd get. I'd also want to play a lot of the 80's vertical classics, so it'd be great for that too. 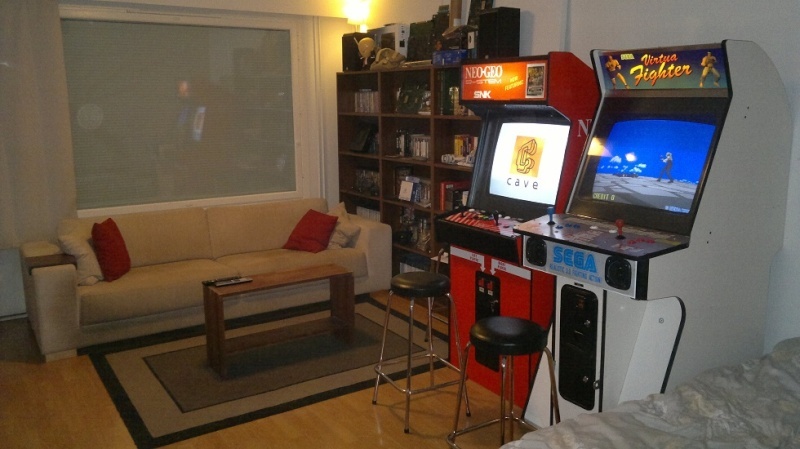 How's the arcade situation in Belgium now? Do you have any arcade halls anymore or have yours too gone bust? It'd be fun to visit some. As you can see, most are various public places with only 1 or 2 old game(s) (number of games is in brackets). Most big arcades collapsed during the late 90s/early 2000s. Several arcade chains turned into small casinos (eg Family Games Center and Circus). The few remaining big arcades are located seaside (Sportland in Blankenberge and Reflex in Oostende come to mind). Some of the newest games can be found there or at traveling arcades on funfairs (most of them replaced arcade video games with redemption machines). The problem in Belgium is that the taxes on arcade video games are too high preventing new businesses to open and causing existing locations to switch. In France for example, taxes are 30x lower and you see several new arcades opening (and with great line-up of games too). A change is urgently needed here! Do you still have many big arcades in Finland? We don't have any arcade halls in finland, that I'm aware of. We too had a lot in the early 90's but they all died out before the end of the decade.